The stratospheric rise of Guadalajara-born Saul “Canelo” Alvarez will come to a thrilling climax as he steps into the ring with Floyd “Money” Mayweather, the world’s best pound-for-pound boxer, at the MGM Grand Arena in Las Vegas on Saturday, September 14. Alvarez’s WBC and WBA Light Middleweight belts are on the line, as is Mayweather’s WBA Super Light Middleweight title, in what is arguably the biggest sporting event of the year. It would represent a major upset if Alvarez, 23, can overcome Mayweather, 36, who will bank at least 41.5 million dollars (plus a significant cut of pay-per-view sales) from the highly anticipated bout, which is on course to become the highest grossing fight in the history of boxing. Alvarez is also guaranteed to take home several million dollars – a far cry from the meager income he used to make by selling ice creams and flavored water to help out with the family business. The youngest of eight children – seven of them male – Alvarez was born on July 18, 1990. He spent his infancy in Tlajomulco before moving with his family to a ranch in the small town of Juanacatlan on the southeastern outskirts of Guadalajara. 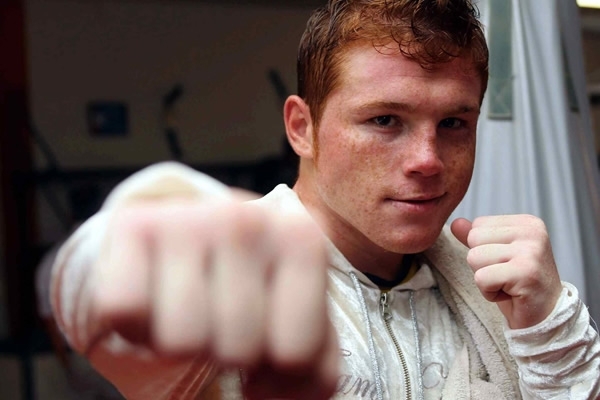 Known as “Canelo” (derived from canela, the Spanish word for cinnamon) because of his atypical appearance, the light-skinned, red-haired boy was bullied at school and eventually expelled after falling in trouble one too many times. At the age of 13, Alvarez began channeling his frustration into boxing and made his professional debut just two years later. He quickly rose through the ranks, claiming his first world title, the vacant WBC Light Middleweight belt, by beating Matthew Hatton in March 2011. He then went on to take the WBA Light Middleweight title from Austin Trout in April this year. Alvarez, who had a daughter at the age of just 17, and was briefly engaged with Televisa Deportes reporter Marisol Gonzalez, has had a tumultuous private life. Earlier this year, the Jalisco Prosecutor General’s Office (FGE) issued a warrant for his arrest for allegedly attacking fellow boxer Ulises “Archi” Solis at a Guadalajara training facility in October 2011. The case has never made it to court but in July a California law firm filed a lawsuit against Alvarez on Solis’ behalf. The FGE is also searching for Saul’s brother Victor Alvarez, who went on the run after allegedly killing a 19-year-old man at a party in Juanacatlan last November. Despite such turbulent goings-on, Alvarez has always put such distractions to one side, trained hard and focused on his career. As reward for his commitment he now enjoys superstar status in Mexico and the entire country will come to a standstill as his fight kicks off next weekend’s Independence Day celebrations. Although Alvarez has an excellent record (42-0-1; 30 KOs) many critics have not been impressed by the caliber of opponents that he has faced. He went some way to proving any doubters wrong in his last fight when he defeated Trout, the previously unbeaten WBA super welterweight champion. Alvarez showed a different side to his game in that contest, displaying good head and upper-body movement and varying his punches against a tough opponent. Mayweather (44-0-0; 26 KOs) is at another level to Alvarez’s previous opponents and beating him will prove a Herculean challenge for the young Tapatio. He will have to adopt a smart strategy and be at the very top of his game to even stand a chance of winning. Although Mayweather is the overwhelming bookmaker’s favorite, he remains unlikely to win via knockout as four of his last five fights have gone the full 12 rounds and his last knockout victory came in 2011. Quick and agile, Mayweather is renowned for his strong defensive style and his ability to avoid his opponents’ blows. He will seek to outlast Alvarez, landing punches as he wears him down and relying on the judges to recognize his superiority in the ring. Alvarez should benefit from the fact that he is a more natural junior middleweight and will be physically bigger than Mayweather, but there are question marks over whether the Mexican has the speed and stamina to wear his opponent down. Any attempt to outlast him would only play into Mayweather’s hands, so Alvarez must be aggressive and aim to strike him from the outset. Alvarez is capable of throwing powerful punches and has won four knockouts in his last six fights. Opponents rarely land many blows against Mayweather, but if Alvarez is going to beat him then he will have to take any opportunities that come his way, make his punches count, and go for the knockout. It may be that this fight comes too early in his career, but even if Alvarez is beaten he will still have some huge bouts ahead of him, including a probable rematch. With little to lose and everything to gain, this fight represents an enormous opportunity for the Tapatio redhead to demonstrate just how good he is, against an opponent of unquestionable quality.